Ophthalmotropic Genetic Therapy – OGT. It is a well-known fact that our sensory organs are special "portals” to the levels of body, soul and spirit, whether we look at it from a diagnostic or therapeutic viewpoint. This is a very obvious insight, especially when we look at the human being as a whole being, a living system in which there are no one-way streets. For a long time the sensory organ of the eye, or more precisely the iris, was seen as an outwardly directed one-way street in regards to a holistic view of its diagnostic and therapeutic implications. In contrast to other diagnostic methods, like for instance Energetic Emission Analysis (EEA), the iris analysis - due to its connection to the organs and their functions or dysfunctions - informs us about the genetic information. The EEA on the other hand shows us the present state that has developed from the given genetic information. Iris – A Diagnostic One-way Street? In spite of all its empirical successes, the iris or eye analysis has still not been generally accepted. Has the particular iris structure that we are considering topographically to be a lung phenomenon truly a correspondence on the organ level? Just from the analysis the validity of such a statement could not be directly proven. To a certain degree the validation has only been possible through the empirical findings during the course of therapy. But if our sensory organs are the carriers of information about acquired or genetic traits and conditions and are also portals to access this information, then it should be possible to use this iris topography to introduce information as well! The OGT advances the iris analysis: For the first time the phenomenology of the iris has now been successfully transferred into treatment protocols and has been therapeutically validated. With the findings of the visual analysis and the therapeutically triggered reactions the location of the organs within the iris has now been empirically proven. In the initial stages of our development of a sensitive and multi-layered network ofanalysis and therapy we had to focus on the phenomena of the iris itself as well as their projections onto the forehead. We always kept in mind that according to our observations the left eye was more associated with the emotional realm, whereas the right eye had a tendency towards more rational values (relationship of left brain/ right eye. right brain/left eye). Our approach was to transfer the "weak points” that could be detected in the iris onto the corresponding topographical areas of the forehead, which then allowed us to draw diagnostic conclusions in regards to stress/ change without taking the details of the presenting symptomatology into account. That led to a synthesis between the iridological and esogetic contexts and the results have been extraordinary. What is the Real Difference in the OGT? What is the real difference between the OGT and other modes of therapy? Well, the points and zones of the topography of the forehead have a direct connection to the brain. 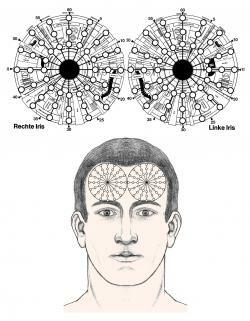 By transferring the "individual genetic mirror” from the iris onto a projection on the forehead we are inducing impulses, which then lead to reflexes on the level of the genetic information. Thus the OGT opens up an infinite number of options to treat diseases along the lines of genetic information. Even genetic misinformation or constitutional weakness, which can lead to physical or psychological stress, can be corrected or strengthened through this information that is being introduced from the outside. In Esogetic Holistic Medicine we achieve this goal through colorpuncture (also UV, IR and Gray Fields), point induction therapy, piezoelectric impulses and acupuncture.